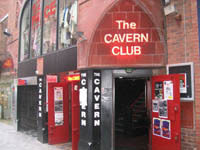 Cavern Club - is a cult nightclub in the history of the world rock music. Opened in 1957, it was the favourite place of jazz connoisseurs. Everything changed on March 21, 1961, when there the songs of the little-known group The Beatles were performed here (it was their first performance!). Nowadays, festivals devoted to The Beatles are held here. Besides, the brightest "stars" regard as honour performing on this stage, which gave a start in life to the great Liverpool quartet. The Baltic Fleet is located in the ancient building, built in the days when Liverpool was considered a flourishing seaport. This is evidenced by some elements of the interior, including wall, which clutch is smoked by old stoves. But the residents of Liverpool and the guests love this pub for you can try the rare sorts of beer, and simply relax in comfortable friendly atmosphere. The Living Room - is a restaurant, which will be loved by those who are not fond of cooking pretentious, but appreciates well-cooked and tasty meals using high-quality environmentally sound products. The cozy hall of The Living Room is spacious enough, and service personnel is attentive and mobile. You can snack, rest between tours, meet with friends and spend time for pleasant conversation.